According to Ayurveda, all functions of the mind and body are controlled by biological energies found within the human body called doshas. 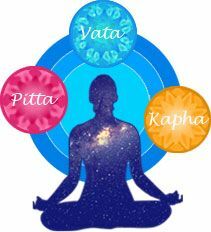 The doshas Vata, Pitta and Kapha are believed to be the ones that make each individual unique in every aspect. These doshas are the ones that are believed to be under control of all our functions. These doshas are derived from the five elements and each reflects qualities of two elements and all three doshas are interlinked. Vata comprises air and space, Pitta fire and water while Kapha earth and water. What happens if they are imbalanced? Since these energies control all bodily functions, their imbalance has many effects on the mind and body. Slight changes in diet and lifestyle can help restore balance which will result in sound sleep, healthy, supple skin and proper elimination of toxins and waste from the body. Making suitable changes improves temper levels, reduces acidity and gives healthy and shiny hair. Balanced Kapha dosha ensures balanced weight, boost in energy levels and reduced congestions. These symptoms are just for understanding and should not be used for self- diagnosis. Consult a medical expert or a certified Ayurvedic expert if you feel the need for any kind of diagnosis to ensure you get the right treatment.